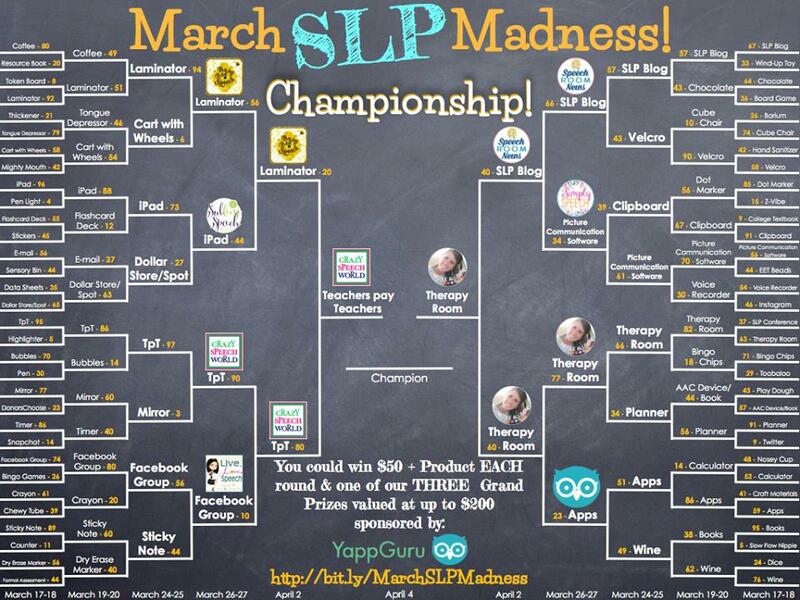 Have you been following March SLP Madness? 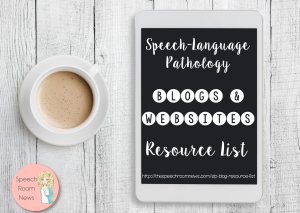 Over the last few rounds, over 400 of you have helped vote for your favorite SLP tool. The bracket has battled it out and now there are only two competitors left! 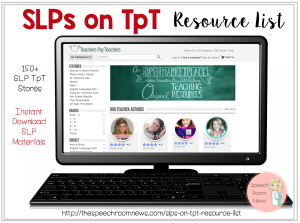 It’s TpT vs. Treatment Room!!! I can’t wait to see who will win! Many have fallen over the last few weeks. Laminator made it pretty far and I’m shocked it didn’t make the championship! 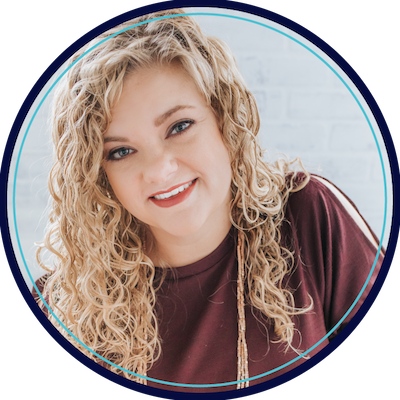 Jenn from Crazy Speech World and I are hosting this round so instead of a $50 dollar prize for one of you, there will be TWO winners who take home a $50 gift card! That’s right, you have two chances to win this round! You can enter to win products from each of us PLUS $50 gift cards. Each vote is also an entry to our Grand Prize drawing one of three gift cards valued at $200, sponsored by YappGuru! AND, if you refer a friend you can earn a bonus entry! Sweet! Cast your vote NOW! 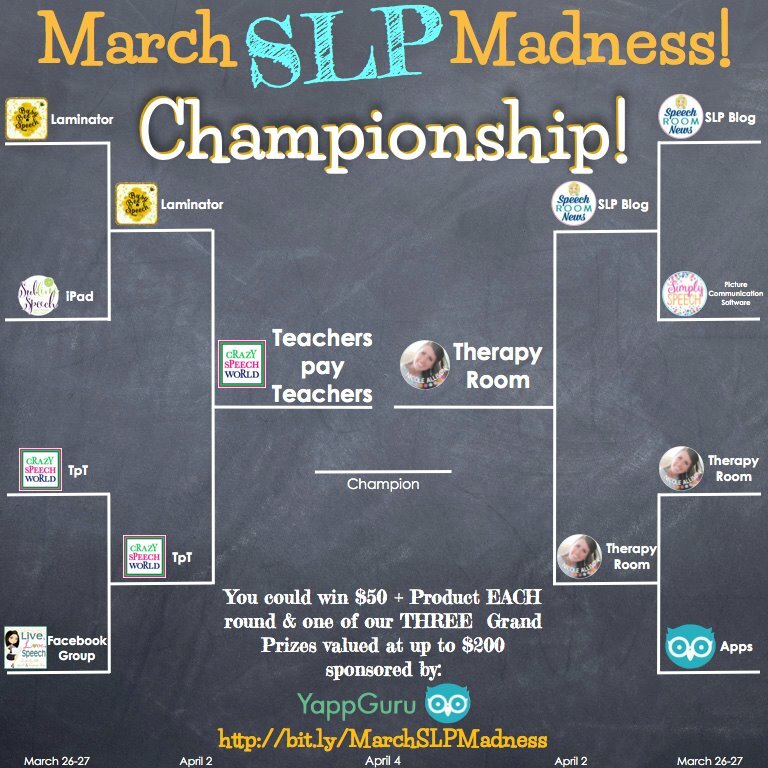 I can’t wait to see if TpT or Therapy Room will win the championship!